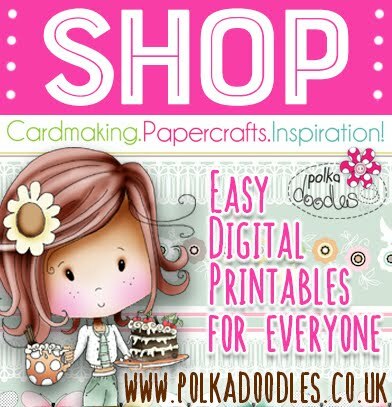 Before we get to business you can see Nikky on Create and Craft TV today at 1pm, demoing some lovely products from Doobadoo! Make sure you tune in on Sky 671, Freeview 36 or watch online at www.createandcraft.tv! 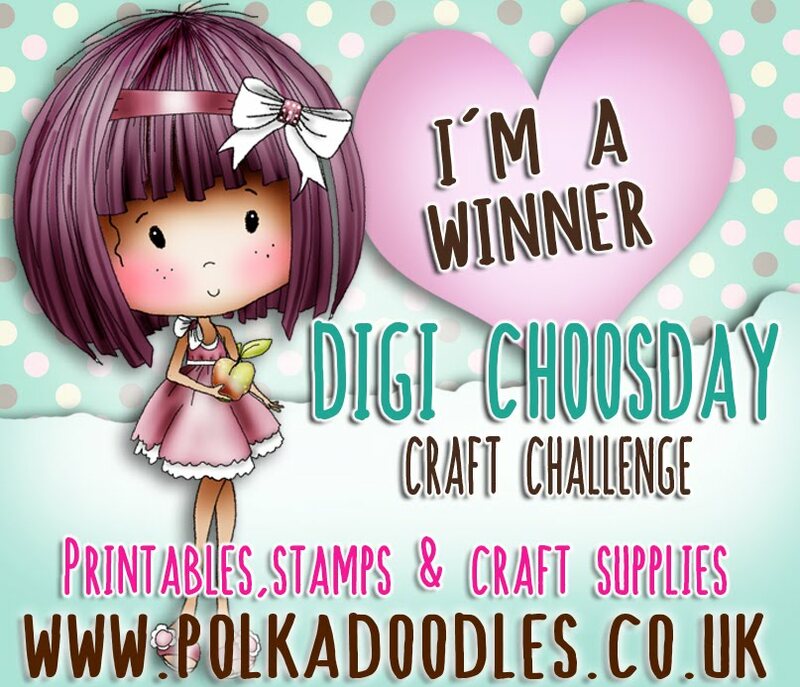 So here we are with another Digi Choosday Challenge and another fabulous CHOOSDAY offer for you too! So don't miss this great offer to grab a bargain! We want to see any of your projects which fit this theme, so it can be fairy/angel wings or animal wings, or even a sentiment that fits too! Which is the latest in our Work & Play Series and is fabulous!!! 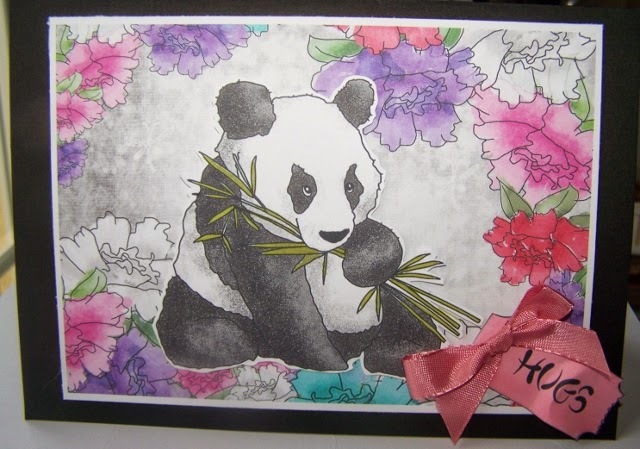 This features 10 black and white and coloured digis plus 60 backing papers, sentiments and toppers - great value! 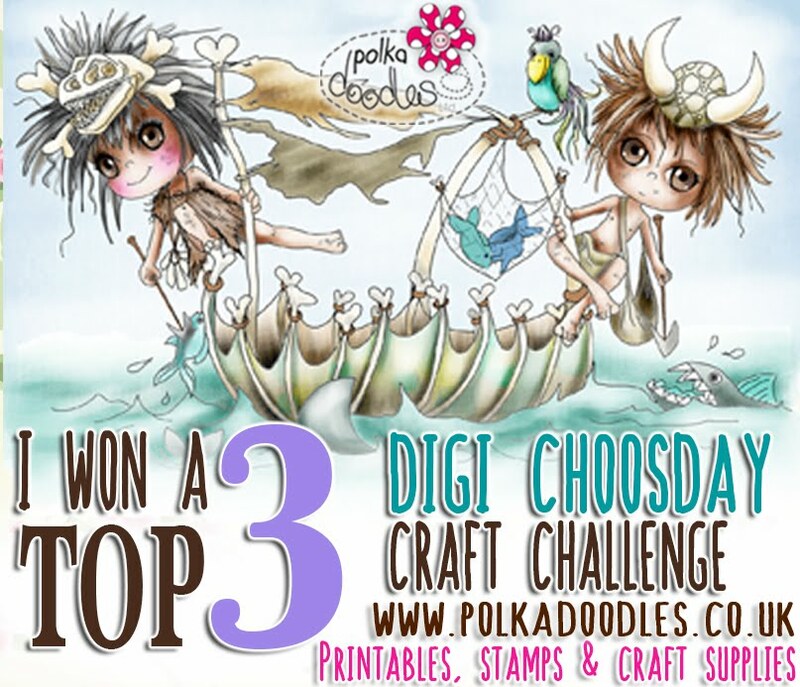 Remember you don't need to use Polkadoodles products to enter the challenge just please follow our rules in the sidebar. Sally - Hi there. Today our challenge is Wings, so I used one of the toppers that was in the Bonbon Belles CD Rom. I printed it off twice so I could decoupage the butterfly. I cut a frame using a Spellbinder's die and matted the topper onto it. I then printed out one of the backing papers and sentiment from the CD Rom, which I matted onto brown cardstock. Added a bow and the card is complete. 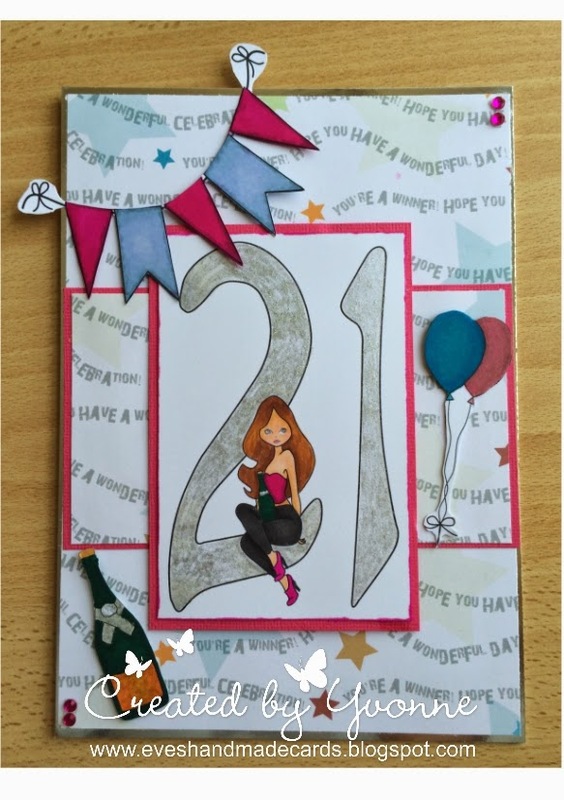 Zoe - I tried something new this week, I used the fab Envelope template from Doobadoo to create a shape on the front of my embossed card which I covered with papers. I coloured the gorgeous Angel character from Emma Canning using my Graph It's - I used Cool Greys for the dot background and then I used Green Greys on the main image, just shows how versatile they are cos I think they look pretty! I added hearts from Doobadoo, gems, washi tape and ribbon from my stash. 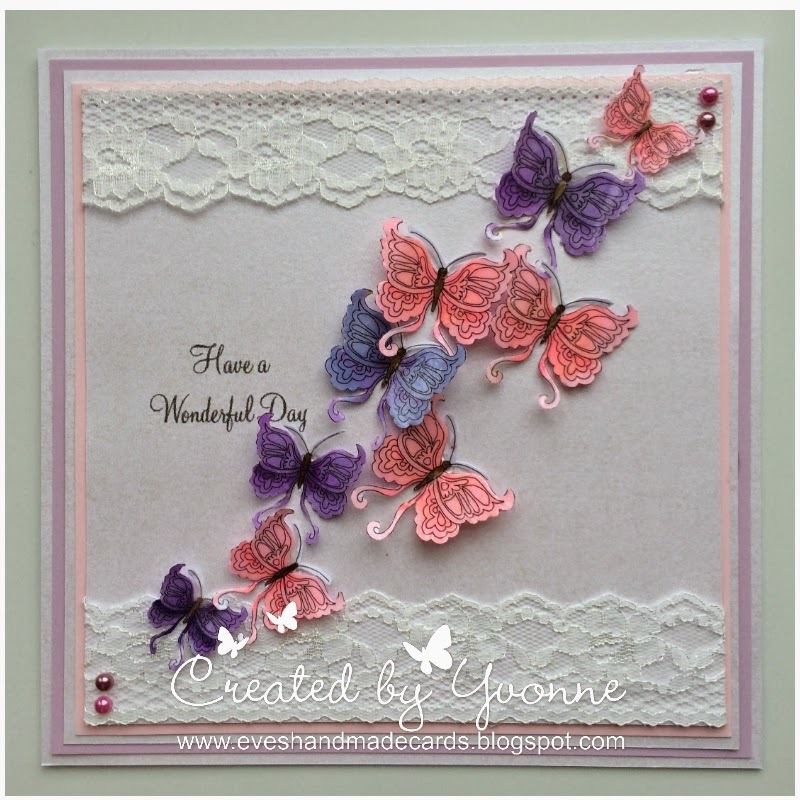 Yvonne - The theme for this week was very exciting for me, I have been inspired to make this card after I saw Nikky do a demo on Create & Craft with a butterfly trail and I thought I would try and do something along the same lines but with my own twist. I used butterfly 2 off of the Dollie Daydream Goes East Collection which is available as a download or as a CD-Rom. I brought the digi image into one of my craft programs and printed off a number in varying sizes. I then coloured them with my Graph'It Markers before embossing them to give them a beautiful glaze. The sentiment is from the same collection, I added lace and pearls from my stash. A good example of just how one embellishment from a jam packed collection can give you great results. Susan - Well this week I have been a little bit naughty and I thought I would tease you all (might not be here next week - Sacked!) .The digi and papers I have used aren't in the digishop shop yet but you can get it on a CD its from Work and Play3 and would you believe it... there's also a Work and Play 4 ... which I haven't even seen yet!! 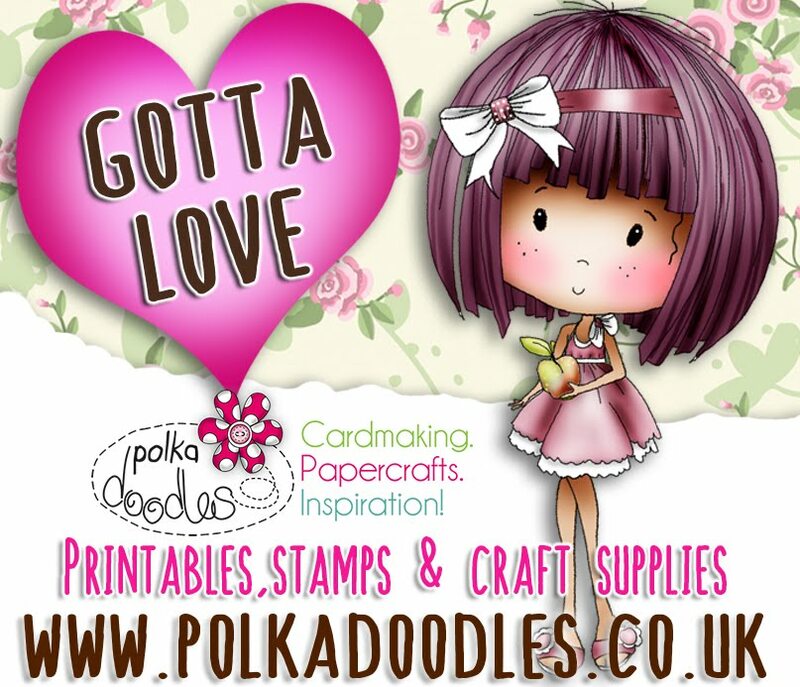 What a fab collection to collect and all available from our very own Polkadoodles. Gorgeous creations from the team as always!! Love the projects this week! We all hope you've had a great Easter and haven't eaten too much chocolate! We want to see all your creations with numbers - now, this is quite specific so we are bending this a little - you can also use the number to relate something on your project ie THREE buttons, FOUR brads etc etc - just tell us in your post how it fits the theme! You have until Tues 13th May to enter this challenge so lots of time to get your entries in! The winner will receive 3 downloads from the digistore! Scatty Jan For my card this week I have used the lovely digi stamp Toby - He is also available on the CD Pretty Tuff (the skateboard is from the CD). I coloured Toby with Graph'It Markers. For the background I used Pan Pastel permanant red with a honeycomb stencil . Sally - Hi for this week's card I chose to use my Double Sprinkles CD Rom. I printed the black and white version of the little girl and coloured her with my Graph'it markers. I then printed out a A4 size number 9 from the Alphabetti and Numbers section. I then cut it out and made a 8 x 8 card using white cardstock. I also printed out some backing paper for the CD Rom. Matted it on black and adhered it to the card. Cut out the No. 9 and the little girl. Adhered them to the card. Added some buttons for the centres of the flowers, punched out some butterflies and added a bow and sentiment. This will be the card that I will send my Step Granddaughter on her birthday. Zoe - This challenge was perfect for me to finally get round to making the box I wanted to make to store Baxter's grooming things in. I coloured the gorgeous Emma Canning 'Doggy in Bath' image with my Graph It markers. I took an old biscuit box and covered it with papers from my stash. Then I added the matted & layered image before adding 'No 1 PET' letters and adding Baxter's name. Yvonne - For this weeks challenge I used the CD-Rom Digistamp Heaven Collection, this collection is jam packed with digi images and I had such fun deciding what to use. As the challenge is Numbers, I thought about iconic ages and selected '21' with has the girl sitting on the number. I coloured the image with my Graph'It Markers, and I went over the actual numbers with the Graph'It Marker Silver Glitter Marker. From the Digistamp Heaven collection, I also used the bunting, champagne bottle and the balloons. The backing paper is from the Work & Play Collection 2 CD-Rom. Susan - I've used Work and Play 2 and the digi is available here, I have coloured him with Graph'it markers . Have also used papers from the collection, the sentiment and the small fence are from Dobadoo .So everything you need is available at Polkadoodles. Jo- for my card this week I used papers and elements from the jam packed sugar birdies birthday collection, including the number, the cute owl and the sentiment. I cut through the balloon string and replaced it with silver cord and decoupaged the owl so it looks like he is holding it, and added some glossy accents to the balloon and owl. 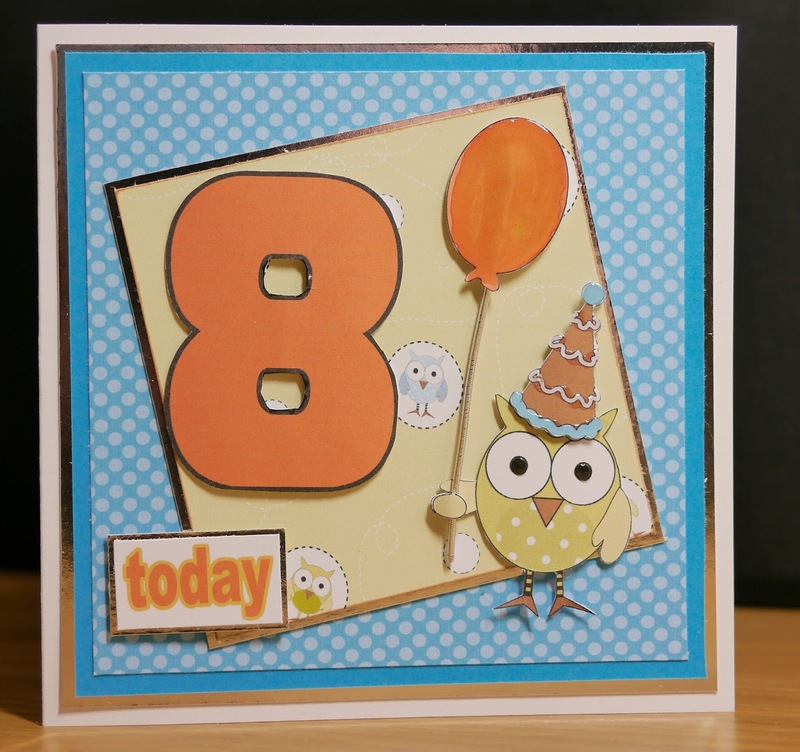 Anjie - Good morning blogland, I am celebrating my birthday today by doing nothing but crafting all day! My wonderful hubby has bought me an eBosser for my pressie to save my arms aching from winding my Grand Calibur, and I have to say, I love it! Now onto my card! The image and candle number are from the Digistamp Heaven CD which is full of Emma Canning's images. The papers are from the Work & Play Collection 1. I've used the Dutch Doobadoo Shape Art 1 stencil and some Dutch Doobadoo Denim Jeans - 2 sheets Dark to create the mats and layers. The hearts and small crown are also from Dutch Doobadoo. I have coloured them with Pan Pastels. 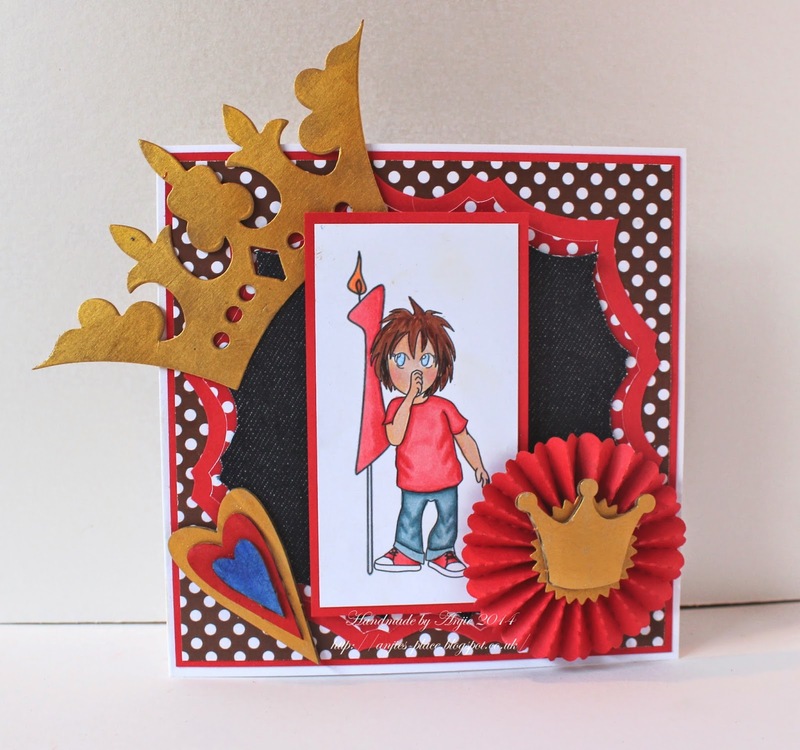 The large crown is a Sizzix die cut which is cut from Kraft card and coloured with the Rich Gold - Metallic Pan Pastel. More great inspiration as always this week! No 10 Gale - well done! Well done everyone! Make sure you grab your winning badges! Happy Digi Choosday everyone! And more importantly Happy Easter for later this week! Isn't that just darling? These collections have 10 fabulous male and female characters included in each collection and each one has 6 unique themes papers (60 in the whole collection! ), plus there are embellies, sentiments and toppers too - it works out at something ridiculous like just over £1 each digi and then all the rest is FREE! Wow!! So let's get to the challenge this week! so a nice easy one for you! However, we made it more difficult for the Design Team by making them PAPER PIECE and this was certainly pushing them out of their comfort zones by making them go really hybrid with their digi crafting this week! If you've never tried paper piecing you should give it a go, it makes your digi images take on a different look entirely! So let's see what the team have for you this week! 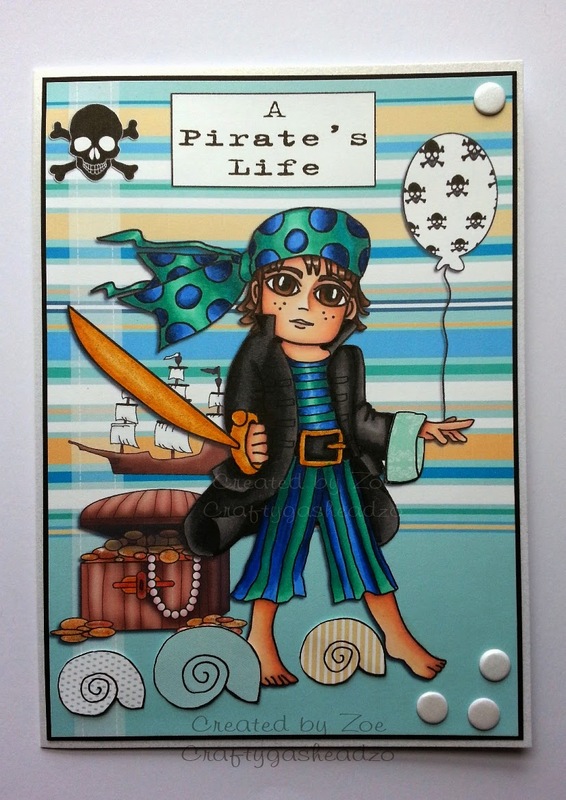 Anjie - The image is Jack the Pirate and can be found here in the Polkadoodles Etsy Store and also on the Bonbon Belles Double CD Collection the papers I have used for the piecing and backgrounds are from the same CD, as are the embellishments and sentiments. I've added faux stitching around the papers and sentiments. Scatty Jan Ohhhhh enjoyed this weeks project - I made a 3d shop front window - I used the little gardener from the work and play collection 2 and coloured him in Graph'it Markers - I paper pierced his hat using one of the papers from the work and play collection 2 , they are really scrummy! I also used some flowers from the Back To Nature collection which I cut tiny and added to the plant pots. I also added in some flower soft to the trellis. I cut some extra elements from the Cherryblossom lane CD which I decoupaged , pots and basket , also the little ladybird - more piccys on my blog. Jo- I don't think I have paper pieced a digi stamp before this project and it is so effective. 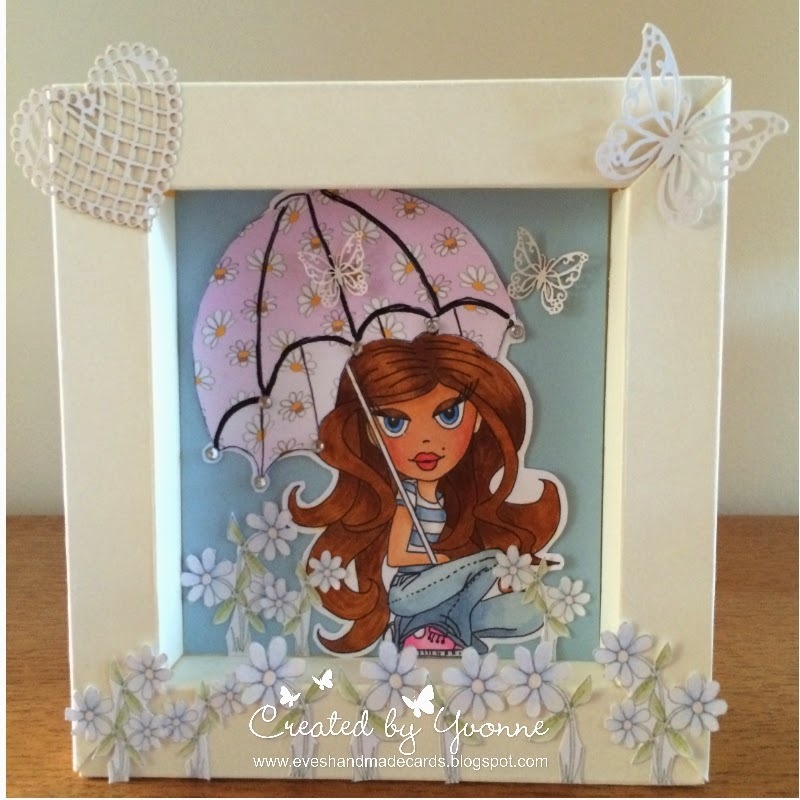 I printed the Dollie Daydream Ready for Rain Digi to colour and layered two more over papers from the Sugar Birdies collection, I then cut out alternate sections of the umbrella and inked slightly around the edges before piecing them together. I also printed a matching sentiment and used a fab paper from the Dollie Daydream collection as my background. I will definitely be paper piecing digi stamps more often! 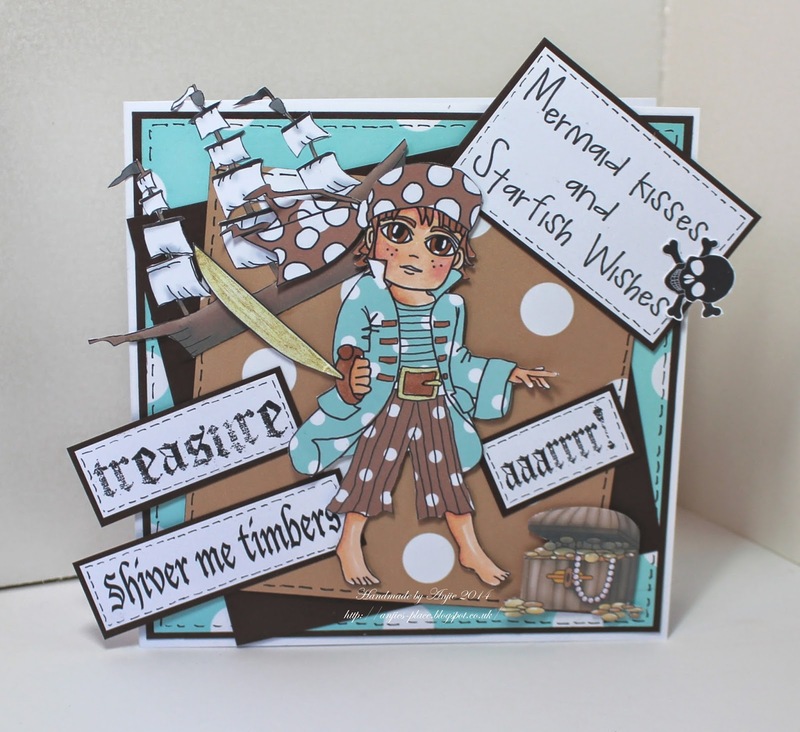 Zoe - This was a challenge for me, but I knew I needed to make a male birthday card for this week so I chose the fabulous papers & Pirate images from Bonbon Belles collection. I took all of the elements into CraftArtist to create my main design - layering the elements until happy to print. I then coloured the Pirate digi with my Graph It markers. I then took pieces of the coordinating paper to 'paper piece' the shells and the cuff of his coat. Yvonne - I have never done paper piecing at all before and found this week to be quite hard. I decided to make a little frame box for a change. I used Ready for Rain which you can get in the Etsy shop or as a download digi from Polkadoodles or as part of the Dollie Daydream Girl Talk CD-Rom. I used papers from the Daisy Papers Download Bundle. The flowers are from the Flower & Leaves Bundle. I added some laser art from the DooBadoo range available at Polkadoodles. Sally - Hello there. I used the Pretty Sweet CD Rom and picked Maddie in digi form. I coloured here with my Graph'it markers and then printed out two of the papers from the CD. I then paper pieced the dress with the two making papers. I cut her out and matted her onto a scalloped oval. Then with the rest of the papers used them as backing papers. Added a piece of lace and ticket sentiment. Debbi - I really enjoyed making this weeks paper piece project, which is a large A4 Get Well Soon card. 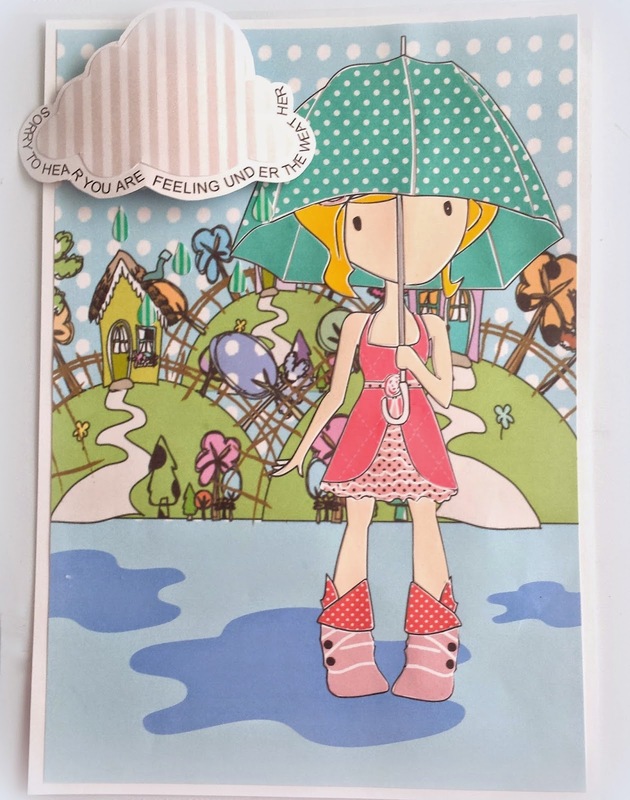 I used Emma Canning's Rainy Days digi, which I have to say is one of my faves, and went mad a totally paper pieced her. The background was taken from the Hoots Tree collection. I used a combination of papers from the Christmas Joy and Dollie Daydream Girl Talk collections. I added a little Glossy Accent to the rain drops to give them a water effect. Wow!! What great creations this week, they pulled it out of the bag again!! Well done! email us here quoting reference DCW12001 to claim your prize of a Digi bundle please! Please email us here to claim your prize quoting DCW12003! Well done everyone, don't forget to grab your blinkies from the sidebar! We hope we've inspired you to join in this challenge - Don't forget that you don't have to use our products to enter and the winner will receive 3 free Digis. You have until Tues 29th April to enter the challenge and the winners will be announced on 6th May. All we ask is that you just follow our simple rules in the sidebar! Today we are celebrating another great Choosday Tuesday with a great special offer code for you! Just a quick heads up that you can see 2 great hours with Nikky on Create and Craft TV tomorrow, Weds 9th April at 8am and 1pm with 2 fabulous stamping shows for you - we all have the record button set already, last time were such quick sellouts we don't want to miss anything this week! Yes, simply ovals, in any shape or form, it's entirely up to you! Remember - you don't have to use our products to enter so the challenge is open to everyone so long as you follow our rules in the sidebar! You have until Tuesday 29th April (noon GMT) to enter and the winner of this challenge will be announced on Tuesday 6th May. The winner of this challenge will receive £5 of free Digi downloads from the store! Well done!! Email us here to claim your prize of a download bundle! Please add code DCW11001 to your email as it helps us know which challenge you are from! Well done everyone, you've all won a digi too so please email us here with the code DCW110123 to claim your prizes and make sure you grab your winners blinkies from the sidebar! 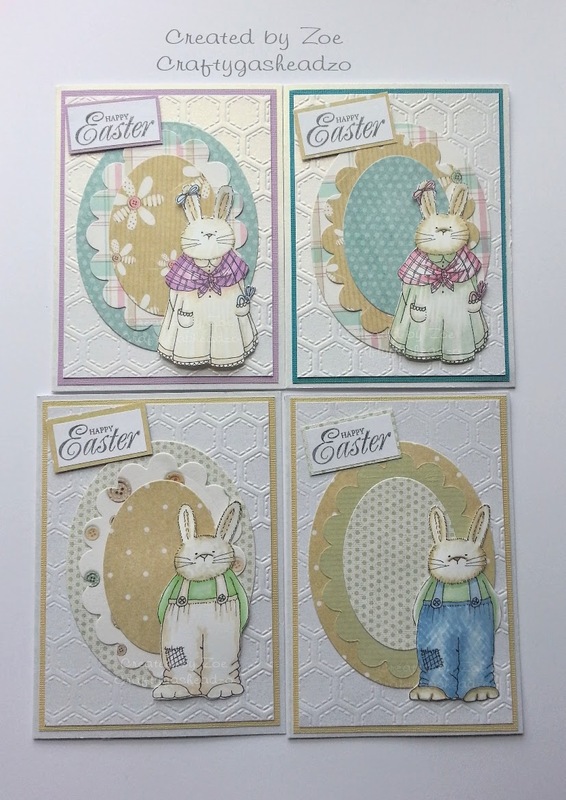 Zoe - I decided to make a set of Easter cards and this challenge allowed me to use my oval dies that I've not touched for ages! I went through my scrap paper pile and pulled out enough paper to create the oval egg shapes on the front of each card. I created a simple background using an embossing folder. 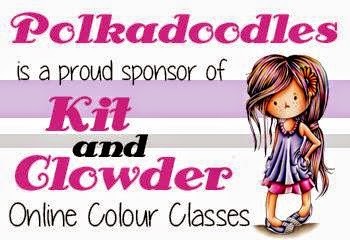 The characters I used are from Cherryblossom Lane collection & they are also available to download separately as Maisie and Wesley I coloured them both with my Graph It markers. 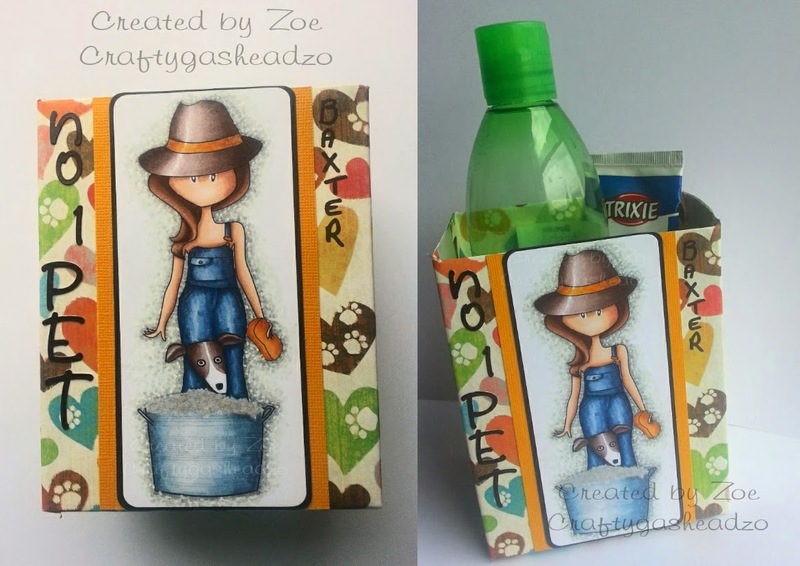 Debbi -I couldn't decide whether to make a card or bag for this weeks oval theme. 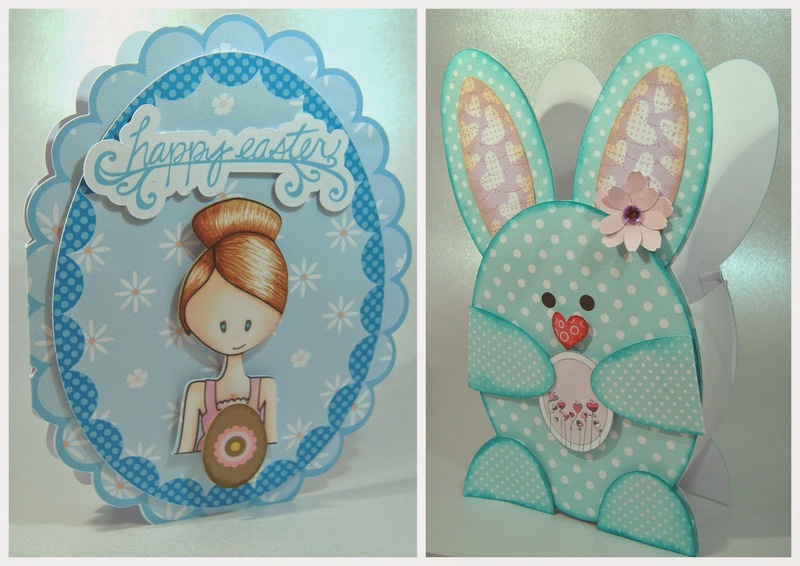 So in the end I went mad and made both...lol :) I made the scalloped oval card using the Boys Hoot collection and have coloured the Cupcake Cutie digi. I have added a scummy chocolate Easter egg using foam pads to give some dimension. The bag was made totally from ovals which I cut from a spotty paper from the Christmas Joy collection (so it's not just for xmas) and inked the edged with Peacock Feather Distress Ink. The inner of the ears was made using a patterned paper from the Heart To Heart collection, as was the little heart I used for the nose. Anjie - For my card I have used the Girls Hoot Download Bundle, which is a bargain at only £3.99 and fab for those of you who don't colour! Both the image and papers are from the bundle. For the eggs I have added some text and cut them out. I also added the text on the balloon in a graphic program. The large flowers are from the DOWNLOAD Dollie Daydream Goes East. Yvonne - For this weeks project, I too have thought Ovals at this time of year can only be easter cards! I used my oval cutting die on plain cardstock to make an oval card and trimmed the bottom to give a flat edge so it could stand. I coloured an image from Emma Canning, available from the Polkadoodles Digi Download Store, called Egg Hunt. I coloured the image with my Graph'It Markers, which can be found here. The papers are from the new Work & Play Collection 2 CD-Rom, not only has this collection got more fab characters, Nikky has included some truly stunning backing papers, as you can see on my card! 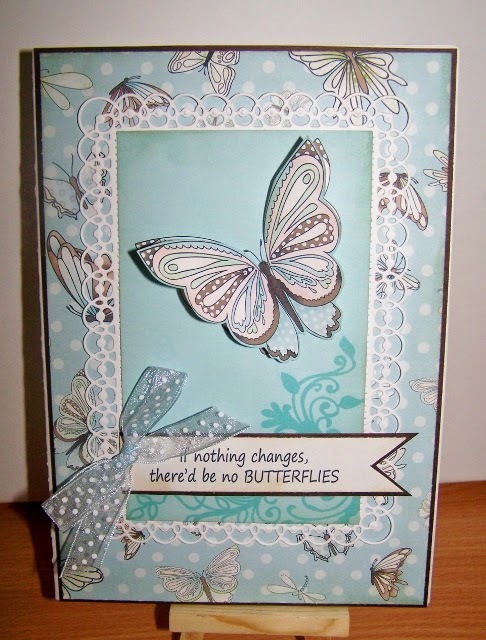 I added some lace and flowers from my stash and I used Butterfly Flourish Signature Die.. I also added some beautiful butterfly's from the Doobadoo laser art collection available at Polkadoodles. I decided to use my Sundae of Seasons CD Rom and picked this lovely flower in a flower pot and fence image and a dotty background paper. I made a stepper card first of all. Then die cut two ovals and cut out my flower image. Adhered it to the back of the card. 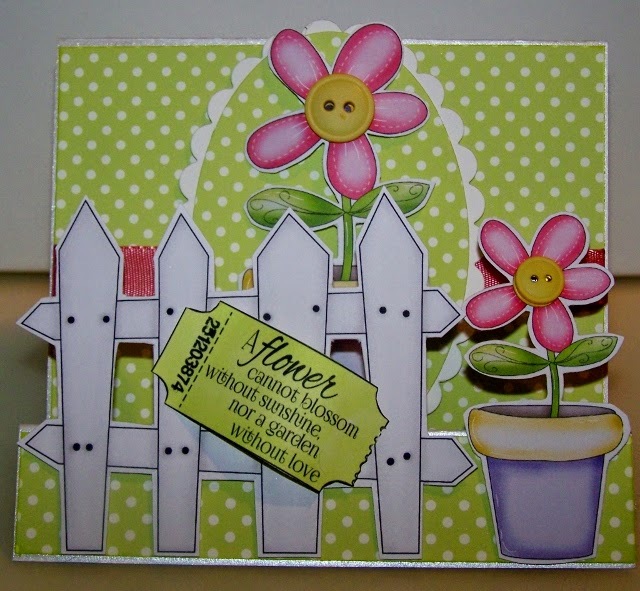 Cut out the fence and the smaller flower pot and added them to the front of the card. I then added a ticket sentiment and coloured it to match the backing paper. 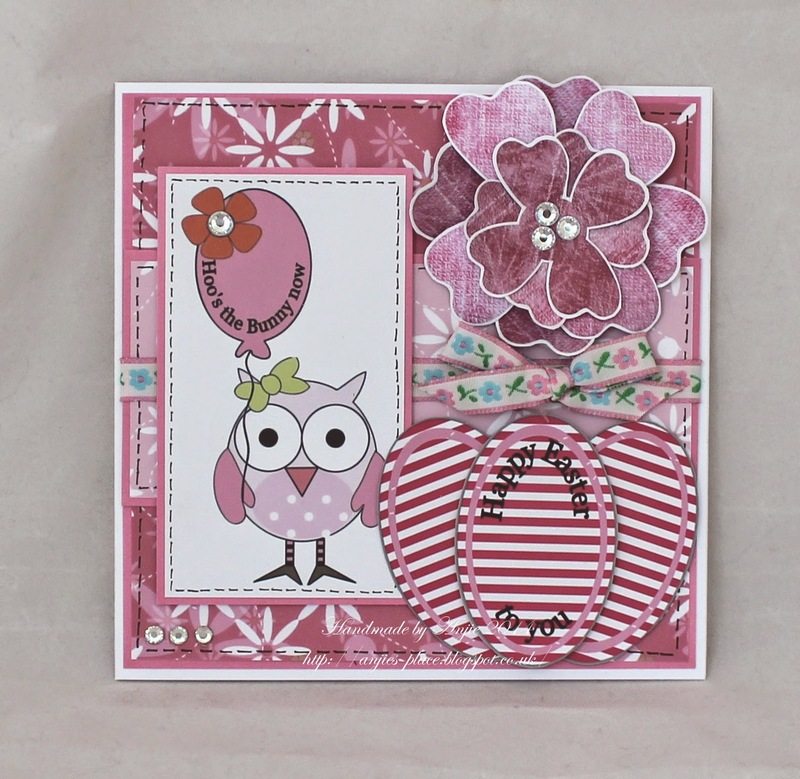 Susan - I used the very Pretty Cherry Blossom Lane CD again. This is such a pretty collection full of adorable little Bunnies and butterflies and Spring like things in an array of beautiful watercolour pastels shades, so fresh and pretty. Wow, another week of gorgeous inspiration, the team have rocked it again this week! Don't forget - you don't have to use our products to enter so the challenge is open to everyone so long as you follow our rules in the sidebar! Thanks so much for joining us again this week - good luck with your entries! We hope you're all raring to go with your crafting today now the clocks have sprung forward and we have lighter nights and therefore much longer to craft in the evenings, yippeeeee!! As a celebration of the Spring, we have a fab special offer for you today! by using code DCW12 at the checkout until 8th April! Woohoo! The Design Team have gone crazy this week and have some fabulous inspiration for you all! You have until 15th April GMT to enter this challenge, so loads and loads of time and the winner will receive a copy of our fantastic new Work and Play Collection 2 which is just fabuLUSH! Remember - you don't have to use our products to enter so the challenge is open to everyone so long as you follow our rules in the sidebar! The winner of this challenge will be announced on Tuesday 29th April. Well done!! Email us here to claim your prize of 5 digis! Please add code DCW10001 to your email as it helps us know which challenge you are from! Well done everyone, you've all won a digi too so please email us here with the code DCW100123 to claim your prizes and make sure you grab your winners blinkies from the sidebar! 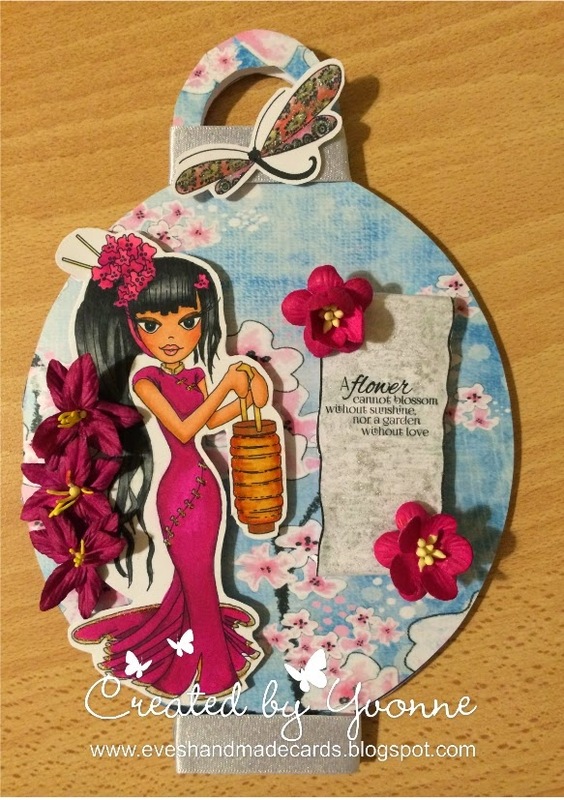 Zoe - I decided to use digi images from the gorgeous Dollie Goes East collection to decorate a picture frame. I started out by colouring the stunning girl image before colouring the flowers - all with the fabulous Graph It Markers. 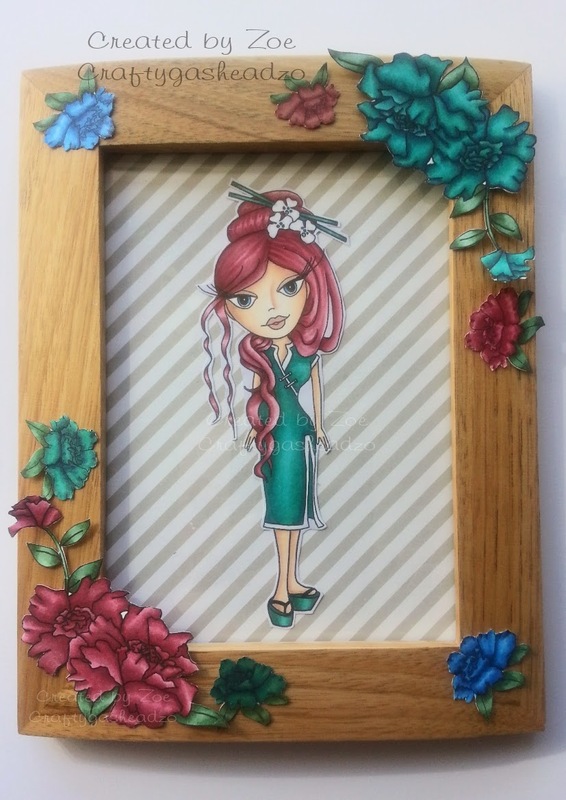 Once done I put the girl onto some background paper inside then positioned the flowers outside on the wooden frame. I often use my digi images on other projects like this! Anjie - On my card this week the image and papers are from the Dollie Daydream Goes East CD Collection as are the large flowers. You can also buy the image separate in the digi download store here. I have used the same papers to make the rolled roses. The flower mats are made using the Doobadoo Flower stencil. The image is coloured with Graph'It Markers. Debbi - I have to say one of my favourite things to do in crafting is to make paper flowers, so was over the moon when I saw this weeks theme. I have made a card and matching gift box set. 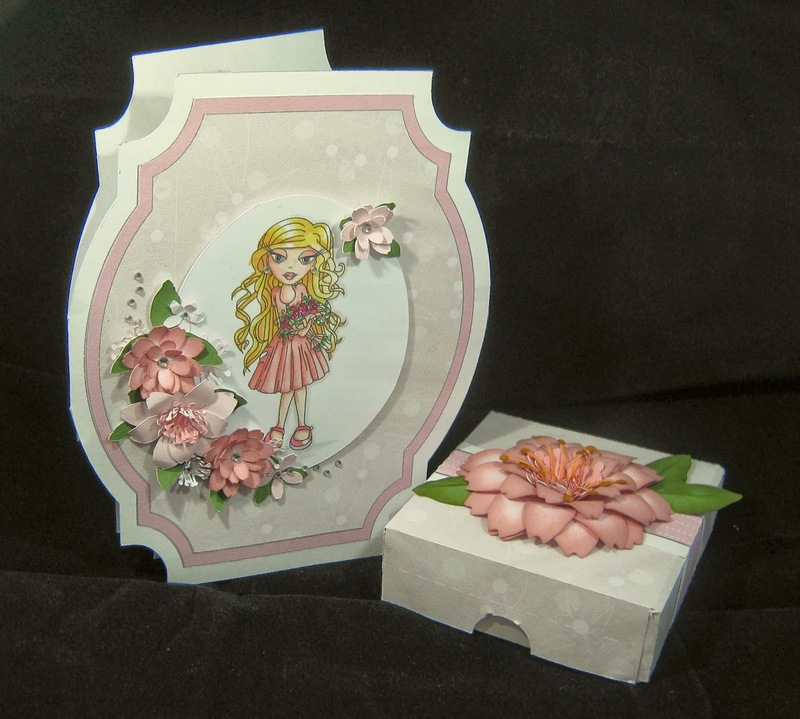 The image I used for the card is the Dollie Daydream Bouquet digi, and all the papers used where taken from the Dollie Daydream Girl Talk Collection. I also sponged the edges of some of the flowers with Victorian Velvet distress ink and adding a bit of sparkle with some tiny gems. 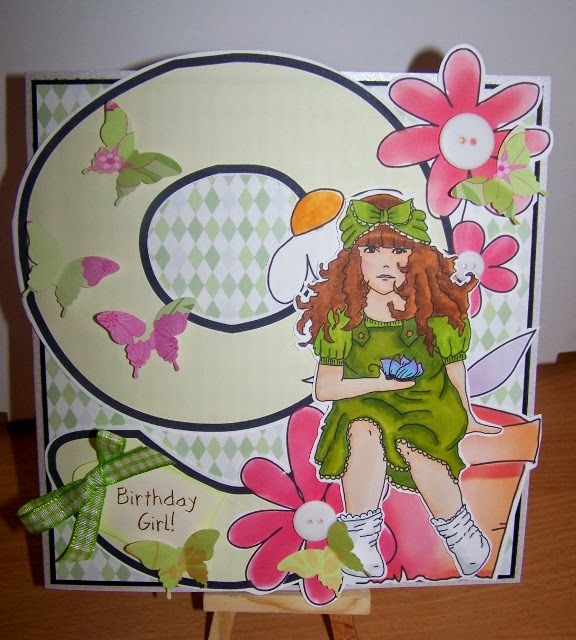 Yvonne - I have a crazy obsession with flowers on cards so this weeks challenge was perfect for me! 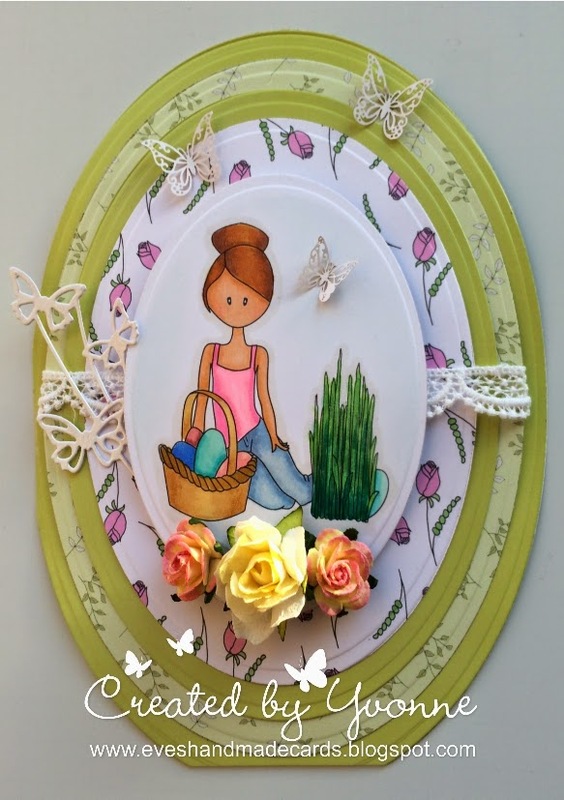 I chose a digi, backing papers, template and sentiment, all from the Dollie Goes East Collecction which is available as a download bundle or as a CD-Rom from Polkadoodles. I used Dollie Goes East - Lantern which is available from the Etsy Store, as a digi download or as part of the collection; I coloured her with my Graph'It Marker pens. As I chose the Lantern image, I thought it would look cool on the lantern template from the collection; so that's what I did! I used the backing paper from the collection, and I printed out one of the scroll sentiments. I went over the sentiment with the phenomenal Graph'It Silver Glitter pen. I used paper flowers from my stash but I coloured them with the same Graph'It Marker that I coloured the dress of the image in - the Graph'It pens just give us such a vibrant colour, don't they!! I added some silver ribbon and one of the dragonfly's from the same collection to finish the card off. Jo- I went out of my comfort zone of colouring characters for this weeks challenge and chose to colour a scene, and I thought the Bee Happy image was the perfect choice for this challenge. 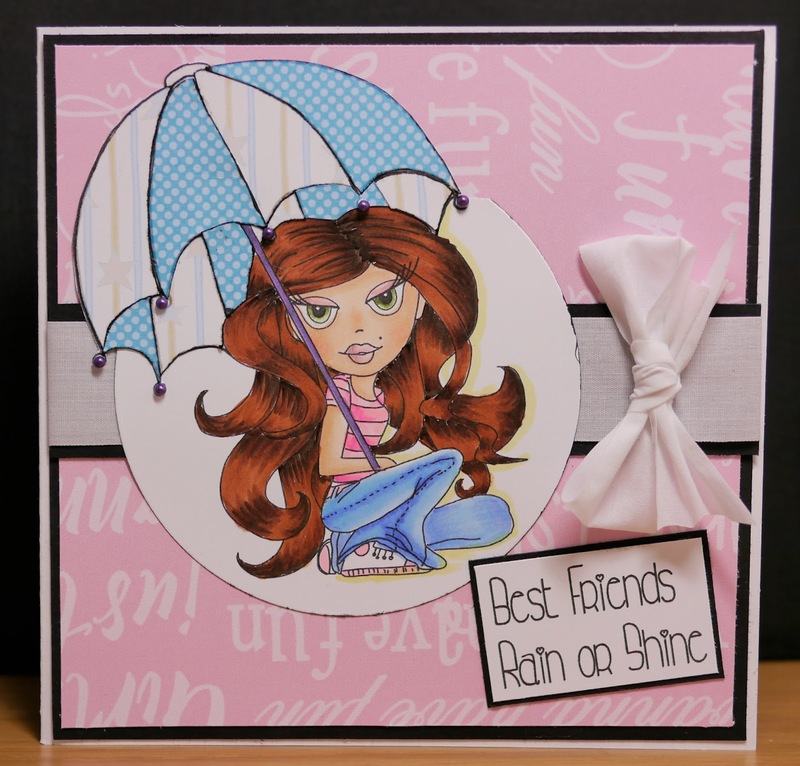 I have used background papers from the Dollie Daydream CD to compliment the theme and added glossy accents to look like raindrops on the flower petals. Susan - This week I have used an image and papers from the Dollie Daydream Goes East CD, the papers in this collection are so lush and the images are amazing. I have used Graph'It Marker pens to colour image. Sally - I decided to use my Dollie Daydream Goes East CD Rom. I chose one of the many lovely backing papers and this lovely Panda chewing on some bamboo shoots. How easy to just click and print out both of these images. I matted the background paper onto black cardstock, cut out the Panda and adhered it to the backing paper. I then printed out some sentiment tickets from the cd rom and coloured it using my Promarkers, added a bow and there it is. So there is the inspiration this week - just fabulous yet again! You have until 15th April GMT to enter this challenge, so loads and loads of time and the winner will receive a copy of our fantastic new Work and Play Collection 2 which is just fabuLUSH! We look forward to seeing all your entries - don't forget to take advantage of that great discount code for the digi store too!